Gallstones are crystal-like deposits that develop in the gallbladder -- a small, pear-shaped organ that stores bile, a digestive fluid produced by the liver. These deposits may be as small as a grain of sand or as large as a golf ball; they may be hard or soft, smooth or jagged. You may have several gallstones or just one. These "silent" stones usually go unnoticed unless they show up in an ultrasound exam conducted for some other reason. However, the longer a stone exists in the gallbladder, the more likely it is to become problematic. People who have gallstones without symptoms have 20% chance of having an episode of pain during their lifetime. 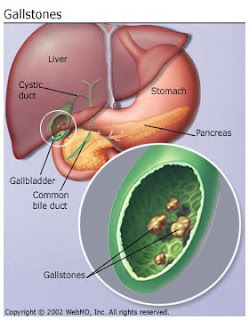 When symptoms do occur, it's usually because the gallstone has moved and become lodged within a duct that carries bile, such as the cystic duct, a small conduit that connects the gallbladder to another tube called the common bile duct. The typical symptom is abdominal pain, perhaps accompanied by nausea, indigestion, or fever. The pain, caused by the gallbladder's contraction against the lodged stone, generally occurs within an hour of eating a large meal or in the middle of the night. Stones can also clog the common bile duct, which carries bile into the small intestine, and the hepatic ducts, which take bile out of the liver. Obstructions in the bile pathway can cause a duct to become inflamed and possibly infected. Blockage of the common bile duct, which merges with the pancreatic duct at the small intestine, can also lead to inflammation of the pancreas (gallstone pancreatitis). This is especially true as we age. (Gallstones occur in almost a quarter of women by age 60.) It's thought that the female hormone estrogen stimulates the liver to divert cholesterol into bile. Pregnancy ups your risk. "During pregnancy you secrete the hormone progesterone in an increased amount and that decreases the gallbladder contraction". Bile lingering in the organ may become stagnant and stones may precipitate out. It is not yet clearly defined what exactly leads to gallstones. This may be one or a combination of the following theories. ~ Inflammation of the biliary system. It is thought that inflammation plays an important role in the formation of gallstones. Changing the pH of the bile leads to the formation of fibrin which, together with the bacteria are the basis for creating gallstones. ~ Backlog of bile. If for any reason (malformation of the biliary obstruction etc.) Cause failures, allowing deposition of bile and gallstone formation. ~ If the bile has elevated cholesterol or bilirubin, and the level of lecithin and bile salts is reduced, creating a possibility to form stones. Sometimes doctors discover gallstones by accident while looking for something else. In that case it's generally best to leave them alone. But if you're experiencing symptoms, your doc will likely suggest cholescystectomy—an operation to remove the gallbladder (which may be done laparoscopically). Fortunately, the organ isn't essential; once it's gone, bile will flow directly from your liver to your small intestine. This is where your gallbladder is located, just beneath your liver. Sudden, extreme pain could mean that stones are causing a blockage: Your gallbladder may be contracting but unable to drain, "so pressure builds up and it hurts," explains Dr. Silverman. But there are many other reasons you might experience pain in this area, he stresses, including muscle spasms. Call your doctor for emergency advice. Sudden, intensifying pain in your intestines—located in the center of your abdomen—could also be a sign of gallstones. A blockage by gallstones can cause a buildup of bile in the gallbladder, which may lead to an infection called cholecystitis. Pain, chills, and a fever of 100.4 degrees or higher are classic symptoms, and may come on after a big meal. There are a variety of ways to detect the problem, including blood tests and a scan that tracks the flow of bile. If you're diagnosed, your MD will likely want to check you into the hospital. The treatment might involve fasting, antibiotics, and pain meds until the inflammation subsides. Bile salts are what make stools brown. If you noticed that your number-twos are pale or clay-colored, that might indicate that a gallstone is blocking the bile duct. Your urine can also provide a clue. When there is excess bile building up in the body, it can turn your pee a darker, orange color. Yellowing of your skin and eyes may occur as well. Read on for more about jaundice. Jaundice can by a sign of gallstones, but when it's accompanied by abdominal pain and weight loss, it may be a symptom of gallbladder cancer. If a tumor is blocking the flow of bile, the yellow-brown fluid may build up in the body and give the skin and the whites of the eyes a yellow tint. Keep in mind, though, that jaundice is caused more often by hepatitis than cancer. In any case, it's a good idea to see your doctor right away. Gallbladder polyps are growths on the inside of the gallbladder wall show up on ultrasounds, often when doctors are investigating unrelated problems. Most of the time, they're nothing to worry about. But people with big polyps have a higher risk of developing gallbladder cancer. As a preventative measure, your doctor may recommend gallbladder removal.